Music artiste and fashionista, Mo’Cheddah and longtime boyfriend, Prince Bk, Bukunyi Olateru-Olagbegi tied the knot in Lagos on Wednesday, May 30th. The couple who got engaged in August 2017 got hitched traditionally in a very private ceremony. Mo’Cheddah and Bukunyi have been dating for many years. Bukunyi is the younger brother of Beat FM’s Gbemi Olateru-Olagbegi. 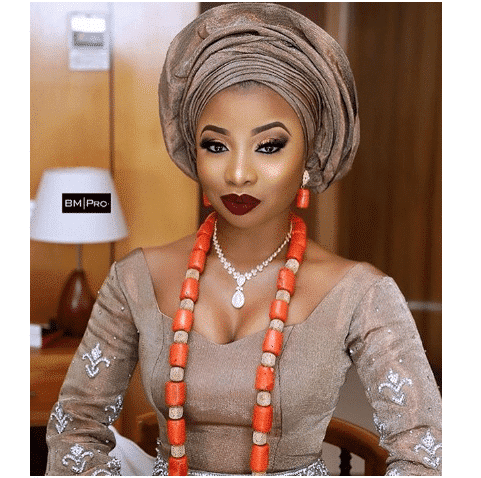 Although the couple have always been open about their love and relationship, the news of their wedding was kept secretly until pro make-up artiste, Banke Meshida known as ‘Banksbmpro’ posted pictures of her view with the bride. The couple’s wedding took place in Lagos. The bride looked absolutely stunning in her traditional attire.